Amphibians are being negatively impacted by the commercial trade, be it for pets, research, food, or other purposes. We can document declining populations and disease transmission caused by this trade. Instead of buying wild-collected specimens that might originate from small populations (e.g., Laotian and Iranian newts, the latest thumbnail dendrobatid), consider other species and sources. To minimize your impact, purchase only captive-bred animals from reliable and ethical sources. Look closely at the current palette of captive-bred species available and try to appreciate their inherent beauty and appeal rather than maintaining a never-ending search for the latest import. Where appropriate, ask for documentation for imported specimens and avoid specimens and vendors lacking such information. We wish that we could invite you to join us by breeding threatened species in your home, but that is not practical for several reasons. The main reason is the risk of introducing new diseases into animals destined for release back into the wild. The equipment and practices required to absolutely minimize the chance of accidents are expensive and difficult. Zoos and other organizations have the resources to achieve this level of biosecurity, whereas most hobbyists do not. However, that does not mean that you cannot do important things with your collection to help our cause! 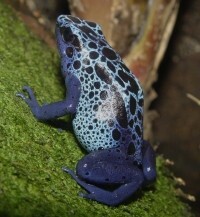 First, you can get involved in collaborations that promote sustainable breeding and management, like the Amphibian Steward Network set up by the Tree Walkers organization, which “harnesses the passion, skills, and resources of private amphibian enthusiasts” to promote activities leading to sustainable captive population management, reducing collecting pressure on wild populations, and supporting conservation action in nature for the species involved. Second, you can use your skills and motivation to make a difference in advancing our husbandry knowledge. Did you know that the zoo community does not even know how to breed our common backyard toads without using artificial hormone injections? Maybe you can show us how it is done, and then these same techniques could be used with numerous threatened species. Please note though, just because your animals aren’t destined for release does not mean that they pose no risk to the wild. We must all work together to keep our animals and their potential pathogens contained. After all, it is the commercial trade that spread chytrid around the world and got us into this mess in the first place. So, for starters, do not ever release your pets. This also applies to native ones you might have collected locally, as they might have caught exotic parasites from your other pets. Also, be sure to properly disinfect and dispose of used substrates, water, etc. (anything coming from an enclosure housing amphibians) rather than dumping them outside. Try to think of the path between the indoors and the outdoors as a one way street. New guidelines for quarantine and hygiene have been developed to help ALL herpetoculturists reduce and eliminate the risk of disease spread. Beyond your collections, try to be a good environmental steward. As our environmental indicators, amphibians are telling us that we are doing damage to the health of the planet. Clearly, promoting better environmental stewardship will benefit our thin-skinned friends but also our own kind. Make an effort to tread more lightly on the planet by curbing your big carbon vices: big cars, big families, hot thermostats, and hamburgers – you know the right thing to do. Get together with friends and collect the garbage from your local wetland. Make a new wetland in your backyard, even a small pond will help. Planet Patrol provides great advice. If you build it, they will come. If you are surrounded by development and they don’t come, rescue eggs and tadpoles from local swimming pools and use them to seed new populations. And try to manage your yard without using pesticides, fertilizers and weed killers, all of which are poisonous to amphibians. Your support is crucial to saving threatened species and we invite you to become an Amphibian Ark donor, helping to keep these species afloat! 100% of funds donated to Amphibian Ark will be spent on ensuring a long-term future for threatened amphibians, and donations to the Amphibian Ark are tax-deductible for most US tax-payers. Many hundreds of community groups and individuals are already helping to support amphibian conservation in many ways, and their contributions are incredibly valued. Please join them – your donations are helping to save amphibian species from extinction! You can make a donation here. There are also great ideas on our Fundraising Ideas page for organising activities for school or community groups to help raise fund, while also raising awareness of the plight of amphibians. Help raise awareness. Start a letter-writing campaign to politicians, from local to federal, to raise their awareness and ask them to encourage and finance conservation activities for amphibians. If you are a student (or you have kids in school), start a letter-writing campaign in your and other schools encouraging them to do the same. And speaking of students, go visit them and share your passion. What biology class would not welcome a visit from a herpetologist? Take the time to interact with a local class, and be sure to tell them about our amphibian-related curricular materials for school kids. 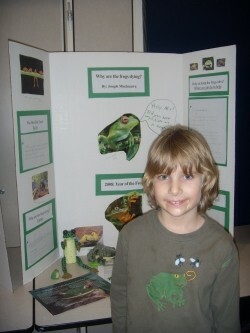 Amphibians have great public appeal! Raise money to support conservation projects where many times even a few hundred dollars can go a long way. Pick a project to support and go for it! Show us your grassroots: organize a bake sale, can drive, or carwash, sell frog tee shirts or stuffed animals, or organize recycling drives for cell phones and inkjet and toner cartridges, which can be sold to recyclers for money – there are countless ways that people have raised funds for amphibian conservation. Start a herp group, band together and pool your resources. As little as $50,000 can save a species from extinction, but just a few dollars a day can buy vital supplies and support project assistants in range countries. GoodSearch and GoodShop It has never been easier to support both the environment and amphibian conservation efforts. Help save the lives of threatened species by using Goodshop.com, a Yahoo-powered search engine that will bring up the results you need and simultaneously donate money to Amphibian Ark. The best part about the partnership? You barely have to think about it. You can perform everyday online tasks while raising money to help the organization protect and restore species for generations to come. In addition to using the search engine, you can easily generate funds by shopping for a wide variety of items from more than 2,800 participating stores and websites on Goodshop.com, including Bloomingdale’s, Office Depot, Groupon and Amazon. Through Goodshop, these Goodsearch partners offer customers coupons and promo codes to help them save money on their usual purchases. For example, use Office Depot coupons for discounts on office supplies, or select a J.Crew coupon to save on some of the season’s hottest looks. In other words, while you are saving big bucks on the purchases you would normally make, you’re also helping Amphibian Ark raise the money it needs to help numerous countries fund their own facilities to care for a wide range of species that are native to their lands and waters. It’s a win-win situation for everybody. As of today, nearly 2,000 amphibian species are listed as threatened for extinction by the International Union for Conservation of Nature and Natural Resources. Even more worrisome? About 165 species may already be extinct. Help researchers, scientists and activists work to protect the creatures that are still around and raise awareness about the ones that may not be around for much longer. Please join Goodsearch today to give amphibian conservation efforts a head start in the right direction. What can my zoo do to help? Each institution that is a member of WAZA or the regional zoo and aquarium associations should commit to saving at least one species, with a rescue center either onsite or in an area in need of capacity building, and preferably both. These efforts should cover at least one ‘species equivalent’ – that is, each center should have capacity for at least 500 animals in a managed program (the target per species), but will not necessarily hold all representatives of any given species. The number one priority for all centers should be native species, or stated another way, centers should be built where the species is in need. Expand and support capacity building (facilities and expertise), at home institutions and in range countries. Assess, upgrade and expand amphibian facilities, and send staff to participate in training courses or internships at institutions with existing capacity, or sponsor someone in need. Immediately support and expand existing efforts, such as rescue programs, field surveys, regional programs (e.g. SSP, EEP, ASMP, APP), and local amphibian conservation projects. Participate in the global public awareness campaign through your web site, zoo graphics, education materials, and media releases. Do your visitors know that we are experiencing the greatest species conservation challenge in the history of humanity? Communicate and coordinate intentions and activities through AArk.